Days of Our Lives spoilers indicate Lani Price (Sal Stowers) stays the night with Rafe Hernandez (Galen Gering). These two bonded over Jordan Ridgeway’s (Chrishell Stause) son David Ridgeway (Ellis twins). With the demands of single fatherhood proving difficult for Rafe, he turns to his friend Lani. She is all too eager to lend a hand. Bonding over this little boy drawn these two ever closer on the NBC soap. DOOL spoilers recall Lani Price has a “type”. Specifically, she seems to be into cops with girlfriends or wives. Recall when Lani first came to Salem, she tried to bed Rafe Hernandez and Shawn-Douglas Brady (Brandon Beemer). Then, she turned to JJ Deveraux (Casey Moss) after those rejections. Later, Eli Grant (Lamon Archey) caught her eye. Both dated Gabi Hernandez (Camila Banus) when Lani made her move. Now, it appears Lani Price is again drawn to Rafe Hernandez. Plus, she took an instant attachment to the child in his care. The fact that his name is David, just like the name she gave the son she lost, seems to add to the connection. Rafe is overwhelmed by the responsibility of caring for this baby. So, Lani is a a godsend. Days of Our Lives spoilers hint her desire to mother David could have her crushing on Rafe. Days of Our Lives spoilers tease Lani Price has an overnighter at Rafe Hernandez’s house. After separating from Hope Brady (Kristian Alfonso), he’s frazzled and overwhelmed. Certainly, Lani sensed he needed her help when she ran into Rafe. With a day off work, Lani was quick to help. However, she forgot she made plans to meet Eli for dinner at a new pizza joint. She’s too fixated on little David. Of course, DOOL spoilers hint Lani spending the night at Rafe’s may be innocent. It’s likely she just fell asleep helping Rafe tend to baby David. But when news of her overnight whereabouts reaches Eli and Hope, you can bet both assume the worst of their significant others. Jumping to conclusions seems to be a family trait after all. 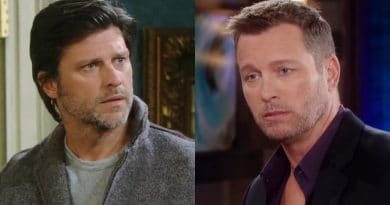 DOOL spoilers show David Ridgeway triggers conflict and strife for two couples. Hope pushed back on Rafe’s desire to have a child and his pledge to Jordan. So, now they are separated and living alone while Rafe plays Mr Mom. Also, Eli is concerned over Lani’s intense attachment to the baby. So, it looks like this baby is not all blessings for these Days of Our Lives pairs. Of course, trouble was brewing before the tot came to town. Hope and Rafe’s marriage quaked on shaky ground for months with him running around to help all his exes. As for Lani, she never quite recovered from losing her baby. See what’s next on the NBC sudser. Check back with us at Soap Dirt for Days of Our Lives spoilers often.